President Recep Tayyip Erdoğan gave insight about Turkish TV series at an event at Beştepe Presidential Complex in Ankara. A new law has been passed that will realize the establishment of a board to support the country's cinema sector and limit the advertising period shown before a motion picture to a maximum of 10 minutes. The Supporting, Evaluation and Classification of Cinema Films law was published in the Official Gazette Wednesday with the signature of President Recep Tayyip Erdoğan. According to the law, supporting boards of specialization fields will be established in order to evaluate the applications in project development, first feature-length fiction film production, feature film production, co-production, script and dialogue writing, animation film production, short film production, documentary film production, post-production, distribution-publicity and domestic film screening support types and to determine the projects that will be supported. Supporting boards will consist of eight people, as four sector representatives to be determined by related field professional associations and three members to be chosen among directors, screenwriters and dialogue writers, actors, movie theater operators, film distributors, broadcasting institutions or organizations representatives and academics working in departments of cinema by the Ministry of Tourism and Culture and one ministry representative. The Committee for Supporting Series and Foreign Films will be established to evaluate applications made in the series and foreign film production support types and to determine which ones will be supported. The establishment of the supporting boards and the committee, office periods of the members and procedures and principles will be determined with the regulations that the ministry will make. Cinema films that are produced at home or imported will be evaluated and classified before they are offered to commercial circulation and screening. The films that are not approved at the end of this evaluation and classification will not be offered to spectators. Cinema films that are not evaluated and classified can be screened at cultural and art events, such as festivals and special screenings, with an x-rated symbol. The evaluated and classified ones can be screened with their rating symbols at these related events. The films that will be screened in the events in question will have to display these symbols and signs in every debut and screening space. According to the law, the duration of ads will be no more than 10 minutes before the motion picture, the duration of trailer screenings will be a minimum of three minutes and a maximum of five. While the public service ads and screenings about social responsibility projects are not included in the designated durations, breaks at screenings will not exceed 15 minutes. Cinema operators will not be able to make sales through subscriptions, promotions, campaigns and wholesales apart from discount ticket pricing that will be determined with a contract made with the producer and the distributor (if any) of the film. They will not sell any other product with a film ticket at the same time. On Tuesday, President Recep Tayyip Erdoğan met with the representatives of the cinema sector at the Beştepe Presidential Complex in the capital Ankara. In this meeting, where the new cinema resolution was discussed, President Erdoğan also talked about the development of Turkish TV series. The president reported that serious developments have been made not only in economy, infrastructure investments, health, transportation and tourism but also in cinema and TV in the last 16 years. Explaining that the exportation of Turkish TV series reached a volume of $350 million, President Erdoğan said, "Our country is following the U.S. in this field and came in second place. It is sure that the architects of this pride are our cinema laborers, including actors, producers, scenarists and directors. I want to thank all of you for your efforts, devotion and works that make us proud. While wishing you success in your works, I also want to hear your requests. No matter how many hospitals or schools a nation has, they will not be successful if they do not sustain their culture and art. We need to reach a serious level in culture and arts. In this context, we want to realize this aim with you. This is why I attach great importance to this amendment." "The Gulf countries love Turkish TV series very much. Whenever I visit one of these countries, I see that their people always talk about our series. They always follow them. This is important progress," he lastly added. 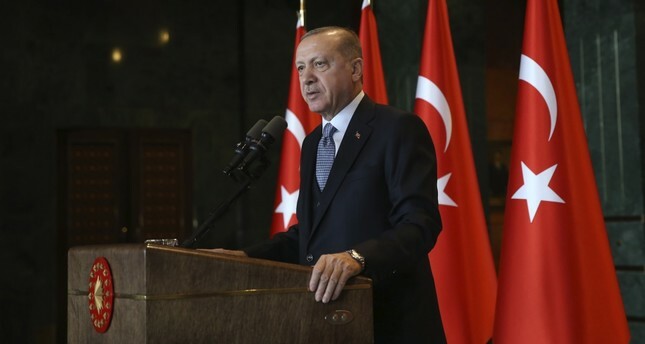 Yesterday, President Recep Tayyip Erdoğan spoke at an event at Beştepe Presidential Complex in Ankara, where he gave insight about the efforts given for artistic improvement in the country. Erdoğan highlighted that he attaches great importance to traditional and modern art since he was the mayor of Istanbul. "We have offered the Lütfi Kırdar Congress Center for the benefit of Istanbul. We will lay the foundations of a much more modern building in place of the Atatürk Cultural Center next week in the Taksim district. We also built the largest opera and congress center inside the presidential complex. We are constructing one of the largest libraries in Turkey at the Rami Military Post, through renovations and restorations. We have increased the number of cultural centers from 42 to 115 and state theater stages from 23 to 63." Erdoğan underlined the success of Turkish TV series at home and abroad. "While the number of the new Turkish films debuted in 2012 was nine, this number reached 180 in 2018. The 2 million local spectators became 44.5 million in 2018. With the ratio of 63 percent, our country is in first place in Europe within the scope of local film ratings. Today, more than 100 TV series are produced every year in Turkey. These series are exported to 156 countries in the world and watched by nearly 500 million people," he expressed.